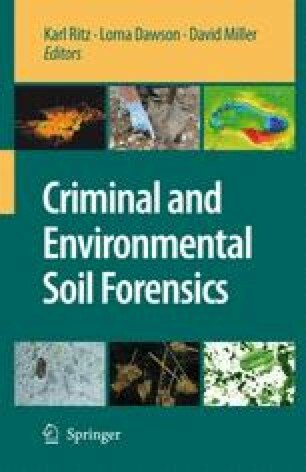 This chapter explores the application of optical laser scanning to the collection, preservation and analysis of footwear evidence in soils using examples from the archaeological record and from a series of experiments. Optical laser scanning provides a direct, non-invasive method of recording footwear evidence with sub-millimetre accuracy. It allows the original print to be re-visited at any time using a range of view angles and light illuminations at any time within an investigation. Although practical problems remain with the routine deployment of such equipment at a typical crime scene, the potential of such techniques to revolutionise the way in which three-dimensional footwear evidence is recorded is considerable. This point is illustrated using an example from the geo-archaeological record and via three experimental scenarios. The first of these experiments involved the use of series of barefoot impressions and the direct comparison of data obtained via optical laser scanning with that obtained from direct casting methods. The second and third experiments involved artificial crime scenes in which a range of footwear was used to leave a palimpsest of prints. Optical laser scans were used to interpret this evidence and to quantify wear patterns in order to link specific footwear to individual prints. These experiments are used within the chapter as a basis with which to review both the advantages and disadvantages of optical laser scanning. On the basis of this review we argue that the potential of such technology in a criminal context is clear given further technological developments to allow it operational deployment.